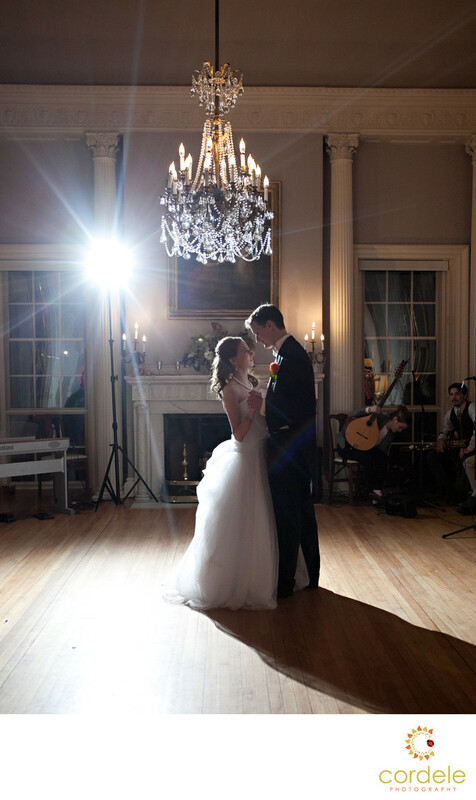 A couple has their first dance under the chandelier at the Lyman Estate during their wedding. The Lyman Estate is one of those hidden venues in Boston that not many know about. It's perfect for a small wedding. It has such New England charm. Its not too old and charm ridden though, it does have AC! In the summer, this place couldn't survive without AC. I love this photo because of where my flash was and how it lit up the chandelier and highlighted the couple. This is an angle I had never tried and it worked so well, that now it's my go to shot at the Lyman. Earlier in the day, we were outside and we found this great shot up against one of the garden walls. It was grungy enough with just a hit of wedding. This photo represents how small and intimate the day was. This photo leaves you thinking no one was there, and to be honest, there could have been no one there. They were so in love and it was amazing to be able to capture the emotion behind them as a couple in such a simple photo.